Many thanks: to Laura for this truly Beautiful piece of art. 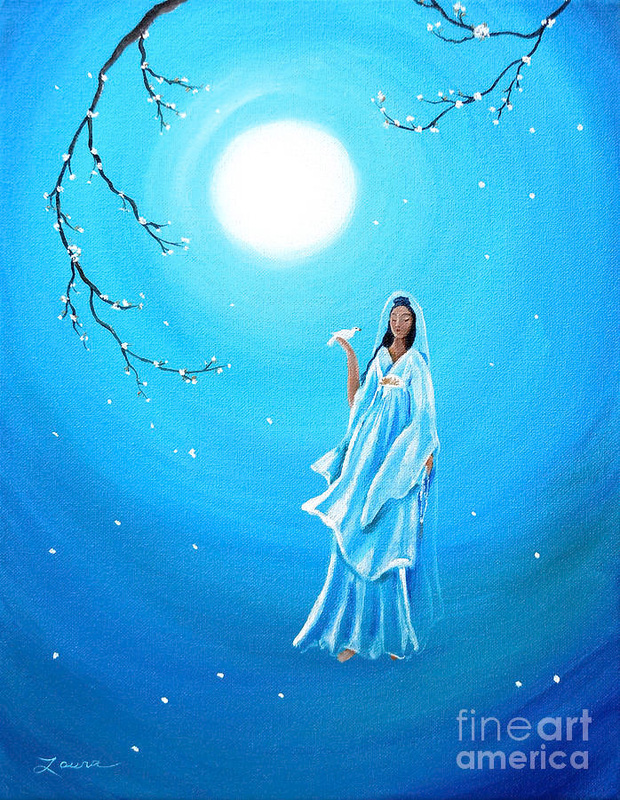 Greetings to you beloved ones, I am Lady Quan Yin; I come forward and deliver to you the vibration of my peace to encapsulate you in all that peace holds. It is peace that I wish to communicate with you about today in order to enhance the vibration and realisation of peace within your being. Peace is energising, enthusing, healing and inspirational. When you embody peace you are allowing the current of the Creator to flow eternally through your being, heart and soul. Peace carries the vibration of truth, clarity and unity for all to experience. Peace isn’t merely silence or stillness but is a powerful quality of the Creator which develops your inner balance, harmony and strength.Peace is contentment with and as the Creator, it is to have no need to seek wisdom or desires because one recognises that they are complete and carry all that is the Creator within their beings. Peace emerges with a deeper and enhanced trust in the Creator, the support and all that the Creator provides. Peace develops with the presence of love pulsating throughout your entire being, emerging from every cell of your body. Peace is not only an experience but an existence emerging from the origins of your being, therefore becoming a powerful representation of your truth. When you carry peace with you wherever you are, whatever you are doing you no longer need to hold on to the aspects of the personality, of judgement, fear or doubt but create a space predominantly within you that allows for true happiness and bliss to infuse and radiate. With the presence of a true and deep peace emerging from within your being, from your soul, you are aware that you are attuning yourself to the vibration of the Creator linking in with your entire being to all that is the Creator. The vibration of your body, energetic bodies and reality become peaceful, existing in harmony and true bliss with the Creator, you will allow yourself to experience everything with ease and to encounter the perfection of the Creator. It is peace that I wish to promote not as an outward energy or experience but as an inward reality in order to bring harmony to the Earth and the situation that humanity have created through neglect of their divine self and manifestation. Peace allows you to acknowledge the divine essence within your being, within each and every person upon the Earth and with all living matter or souls. This acknowledgement if accepted by a vast majority can instantly detangle all situations of pain, chaos, imbalance and harm that humanity have and are causing to each other and the Earth. Due to your physical realities being so solid and real to you it would seem that to heal yourself, to heal your actions and the actions of humanity as a general body that you would have to solve problems in the outer physical reality. This of course can bring a greater appearance of peace and harmony being restored in any situation but often those involved are still not content or fulfilled, often believing or demanding that they deserve more, maybe as compensation or to heal their inward pain. It is often that actions in your physical reality do not always create the fulfilment and contentment that is needed. When an action of any kind is instigated from deep within your being, your soul and truth then it is carried forward to the situation or those involved almost as if it is filled with so much nurturance and truth that it instantly fulfils each and every person and soul involved. Each person recognises the truth of the Creator in the energy, due to the truth of the Creator being presented the situation becomes harmonised by the vibration of the Creator, brought into perfect balance and perfection. When the vibration of the Creator is presented everything becomes attuned appropriately even when fear is involved. If each person allowed themselves to access the peace that is the Creator within their being, permitting peace to emerge within every action that they take and every thought made, then peace would instantly manifest all over the world even in situations that seem so entangled with fear and pain. Peace would manifest outwardly in the physical reality of the Earth because it would trigger a deep remembrance and resonance of and with the Creator. All that is being held onto and no longer needed would insistently fall away, leaving only that which is true, blissful, love and the Creator. Peace is often associated with the mind, as you are asked and encouraged to create a peaceful mind free from unproductive or fearful thoughts but peace can and does develop on a deeper level within your entire being. Peace as I have stated ignites and flows from the soul and truth within you, it is valued as a power, a source of protection while also allowing a deeper unity with the Creator. Peace and all its beautiful qualities can be an emotional state which remains as an expression of your being throughout any situation, meaning that your emotions are balanced rather than soaring from one extreme to another. One can still experience sadness or happiness emotionally but with the presence of peace there is no attachment or holding onto the emotion, it is experienced almost at its smallest volume, once recognised it glides away. Even when an emotion is experienced peace is always present as a support, power and strength. would vanish. The body would be content, experiencing the wealth and abundance of the Creator, completely and absolutely in harmony and wellness. Often complaints of the physical body are like discontentment sometimes sourced from the energetic bodies or the mind, when peace is present bringing forth the vibration of truth then everything is attuned to the Creator becoming content, healed and the perfection of the Creator. your experiences and the present moment, content with all that you have discovered and at peace with the idea that everything will flow from you with divine timing. Contentment and peace with your spiritual journey is a powerful tool to wield as it allows you to look within rather than seeking with urgency outside of yourself. With peace in your spiritual being you have the ability to relax deeper into your truth and inner guidance. Peace encourages you to realise that in truth there is nothing to seek, all is already present, which can bring a deep healing to your entire being. The hunger, urgency, yearning for ascension may also subside allowing you to experience the joys of ascension with ease and perfection in divine timing. It is sometimes that the hunger for ascension can create a block or can limit your ascension as you try to force and push yourself to experience that which will be experienced with divine timing. 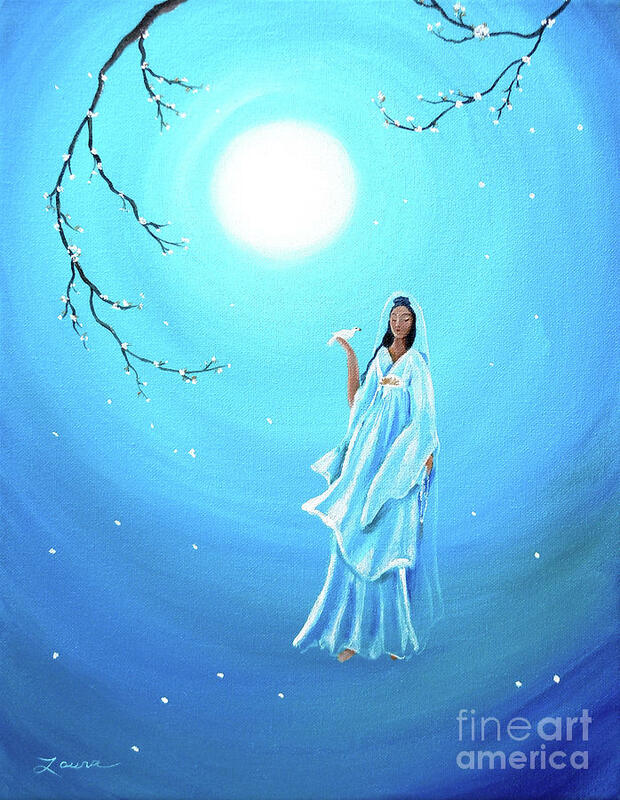 ‘Lady Quan Yin, I call you forward to support, enlighten and nurture my entire being and existence as a light source in this physical body upon the Earth. I ask that you become one with my heart and soul so that we may share in the love and truth that is the Creator. balance and Creator focus to my entire being, within all levels and bodies of my being. I now experience the vibration of peace from my soul emanating into my physical body, etheric body, emotional body, mental body, spiritual body, entire being and existence on the Earth. Take some time to allow the essence of peace from your soul and heart to flow and merge with your entire being.